Clifton City Hall is located at 900 Clifton Avenue, Clifton, NJ 07013; phone: 973-470-5854. Photo: John and Anna Vreeland House, ca. 1817, 971 Valley Road, Clifton, NJ. Listed on the National Register of Historic Places in 1982. Photographed by User:Lithium6ion (own work), 2011, [cc0-by-1.0 (creativecommons.org/publicdomain/zero/1.0/deed.en], via Wikimedia Commons, accessed November, 2013. The history of the City of Clifton is closely aligned with the history of the Passaic River and its neighboring cities of Paterson, Passaic, and Newark. Before the seventeenth century this part of northern New Jersey was inhabited by a group of tribes, who were Lenni Lenape Indians. These peaceful native Americans were seminomadic, who subsisted largely on fishing and hunting, but some also raised maize, beans and squash. They named this area along the Passaic River "Aquakanonk" (Ach-quoa-k-han-onk), which means a place in a rapid stream where fishing is done with a bush-net. This name was used for the Clifton-Passaic area until Passaic was incorporated in 1873. The first white men to arrive in the area were the Dutch, who established a trading depot on Manhattan island in 1613 and a smaller post in what is now Jersey City in 1618. The English were quick to move in on these settlements, and two years after the British took over the New Amsterdam colony in 1664, Robert Treat led a band of colonists from New Haven to Newark. In 1679, the Aquakanonk tract was purchased from Captahem, the local sachem, or chief, by fourteen Dutch and English settlers, who laid out farms of 100 acres each and kept the rest of the land in reserve. The Dutch pushed south to the Newark border, and this precipitated a boundary dispute that lasted for many years. In the mean time, the Aquakanonk Landing area grew rapidly as a trading post and crossing point on the Passaic River. During the Revolutionary War, both armies passed over the Aquakanonk bridge many times, most memorably on November 20, 1776, when Washington's soldiers dismantled the bridge as they were retreating from Hackensack to the south and west from the British. The British did not catch the retreating colonists, but did pursue them and left a small garrison at Newark. After the war, the lower Passaic valley continued its economic growth, powered by many mills and other businesses that used water power to manufacture goods. Aquakanonk and Newark were the main trading centers on the river, and did a brisk business as farm products moved down river and manufactured products came back up. The Third, or Yantacaw, River alone had seven mills along its banks. Small vegetable, or "truck" farms, have been a part of Aquakanonk and Clifton life since the first settlers. In the Richfield section of town the combination of rich soils, shelter from storms provided by Garret Mountain to the west, and access to the Morris Canal allowed farms to thrive. "Little Germany," as Richfield was known, produced bushels of cabbage, beets, scallions, tomatoes, eggplant, and apples. There were a number of dairy farms in the area, including Ploch's 55-acre farm, which supplied milk to generations of Aquakanonk residents. There was Bruning's horseradish farm. These truck farms supplied produce for area residents, and used the Morris Canal and the Passaic River to make farm products a major part of commerce with Newark and other downstream municipalities until industry took over. Although only three farms remain in the city, the Richfield, Ploch, and Schultheis farms, all of which are along Grove Street, the country flavor they provide is still a part of Clifton culture. The effects of industrialization on the Passaic River and Clifton are well documented in other sections of this inventory, but the industrial period also gave the city much of its current density, infrastructure, and ethnic diversity. For example, the completion of the Dundee Dam and Canal in 1861 sparked a surge in manufacturing. 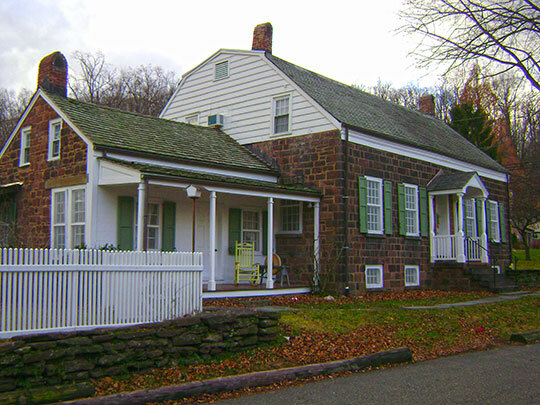 Housing was built during the 1870s to provide a nearby labor force, and industrial growth accelerated in Passaic and Clifton. The huge Botany Mills factory complex was built in 1889, covered 60 acres, and employed 6,000 workers. Manhattan Rubber came along in 1894, and at its peak employed 3,000 people. These and hundreds of other factories attracted immigrants from central, eastern, and southern Europe, especially Germans, Poles, Russians, Slovaks, Hungarians, and Italians. The worsted wool mills were the dominant industry in Clifton, Passaic, and across the river in Garfield, employing more than 20,000, but there was a wide range of different types of factories. The largest individual silk mill in the U.S., the Henry Doherty Silk Company, was built on Main Avenue in 1908 and soon employed more than 1,000 workers. The Athenia Steel Company, which is now being converted to a recreation and housing complex, started to manufacture spring steel and steel wire in 1907. After World War I, African American workers from the South moved to this area to work in the factories, and the industrial sector continued to grow. Curtiss Wright Propeller Division arrived in 1938, and the Allen B. DuMont Company began the production of the first American-made television receivers after World War II. However, the collapse of the American textile industry and the general trend away from heavy manufacturing hit this section of Passaic County especially hard in the last third of the twentieth century. It is these post-industrial sites, often along the Passaic River, that offer Clifton and other urban areas along the lower Passaic River a golden opportunity to redevelop and renew themselves as they clean up the river itself. City of Clifton, Passaic County, New Jersey and the Passaic River Coalition, Natural Resources Inventory, 2003, www.passaicriver.org, accessed November, 2013.